iPhone and iPod touch devices. AppCone was started in 2010 by Joe Lanzi. The company is located in Atlanta, Georgia. 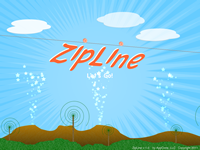 ZipLine was discussed on the "Two Wheel Adventures" show on Garage 71 Radio and Live365... Thanks for all the kind words and enthusiasm, guys -- keep on playing ZipLine! special discounts on apps, FREE apps and more!